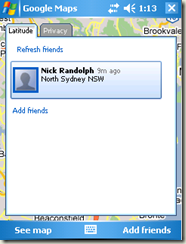 I have to say that the best application for Windows Mobile, just got better. 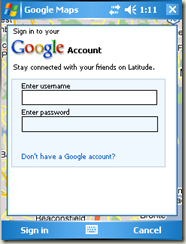 The newly released version of Google Maps for Windows Mobile not only hosts a new user interface, it also supports Google Latitude. 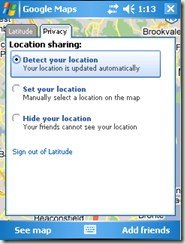 Essentially Google Latitude, with your permission of course, allows you to track and share your location. It’s as easy as signing in with your Google account. 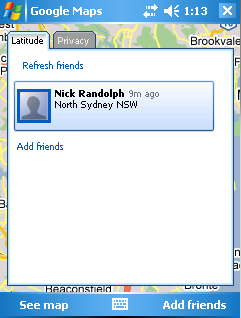 Once you’re in you can add and remove friends. 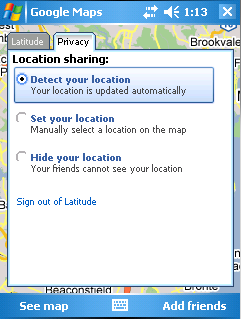 You can of course control how visible your location is via the Privacy tab. At this stage there is no API available according to postings on the Google Mobile forum. 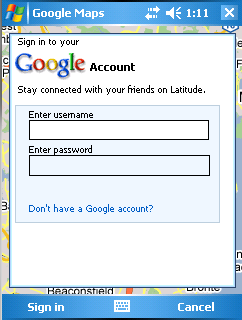 Get started with the latest version of Google Maps with Latitude by going to http://google.com/latitude on you device. GFsoul does web hosting and takes care of all the important details like domain name registration. Our design and hosting services perfectly compliment each other; we are offering customers true “one-stop shopping” experience, and at extremely affordable prices. You won’t find customized web design and hosting at these amazingly low prices anywhere buy here. Our web hosting services features all of the same appointments that other (better known) web hosting services can offer you, but with lots of great tech support, customization and a lower overall cost.